We needed a quick--and cheap--replacement for the dirty bedroom carpets. After we removed the staples and tack strips, the plywood subfloor had too many bad spots to leave as-is. I compared laminates and prefinished wood floors, but nothing matched our existing hardwoods. I simply painted the floors with porch paint. I love the shine. I bought white high-gloss by Sherwin Williams, which coated better than the big box brands I've used in other houses. One gallon cost $40 and covered two bedrooms. Rolling on another coat is no harder than mopping a floor. In my heart, I know a green-and-white checkered pattern would have looked incredible. In my head, I realized none of the beds would fit through the door frames. I had to move furniture to one side, paint 2 coats, and then repeat for the other side. The process, though cheap, is not without drawbacks. We all lost sleep as the kids adjusted to sleeping bags. We had to wait a few days for the paint to cure. We've already had one gouge from a leg without felt pads. But I'm a rescuer of old and pretty things. A little wear doesn't bother me. For all the light we gained, an imperfect floor seems like a small price to pay. I love that!! Thank you so much for sharing! Simply gorgeous. Plus, think how easy cleanup will be should there ever be a stomach bug! I think it's very practical. Wow, you have been busy! The floor looks great and makes that room look huge! That may be the most beautiful bedroom for little ones that I've ever seen! My goodness I just want to come over and curl up with my baby and some books. Do you think your kiddos would mind if we moved in? How the colors glow against the white! Beautiful! It looks soooo clean with the white on the floors. Love it. love it, love it! Wow, that looks great! When you say the floor was plywood, do you mean the type of floor that is under carpet in newish homes? Our house is 5 years old and our carpet is trashed (three kids one dog and light beige carpet in the dining room, what was I thinking????) but putting in hardwood throughout the house is not really an option. I'm wondering if I dare pull up the carpet and just pain the subfloor, or if you got such good results because your subfloor was a nice high quality actual wood floor? It looks better than I imagined, and I knew it would look great! Amazing how much it brightens the room, isn't it?! That looks great, so clean and bright! Thanks for the idea. I think that is such a beautiful room! You should also start a decorating blog. I love your room--it is beautiful and the paint looks great. Love how it brightens the room! Is a high gloss pretty easy to clean on wood? Isn't painting a wonderful way to give yourself a whole new look without a lot of money! Your rooms look ready for a magazine cover shoot. Meredith, the painted floor looks beautiful! I think it totally makes the room. Love the yellow in your kitchen too! It looks beautiful. I often painted floors in my old house, so I know all about rearranged sleeping and smells and gouges! I love the shinny white floor! Great job. What a talent. When we took up a carpet once the sub floor was that terrible stuff with huge screws everywhere. Built in the 80's, the house had all sorts of short cuts in it. Great job again. These floors are simply stunning, Meredith. I cannot believe how good they look. I, too, love things light, bright, and airy, so I am wondering if a solution like this would ever work for us. My husband would probably think I am nuts if I suggested ripping out our dirty old carpet (not that he's in love with it any more than I am!) because it's so different than anything else we've ever done on this house. But we have NO extra money right now for new floors, and the carpet is depressingly yucky, so this is something he and I are going to have to talk about. I will persuade him with your pictures!! :-) Beautiful, beautiful, beautiful!!!! What kind of SW paint (finsh)...just regular latex??? I want to do this to the concrete floors in my dining room. Meredith, that is absolutely beautiful. We too have been discussing new flooring options. The previous owners obviously didn't have children in the home when they carpeted our dining area with light beige carpet! Either way, this is an option I hadn't considered. Thank you! I reread the post. You said high gloss porch paint. I just got so excited looking at the pictures that I missed the details in the post. This may be a perfect solution to the hideously ugly carpet in the dimly lit basement playroom. Can you think of any reason this wouldn't work in a basement room? You amaze me! That is just gorgeous! The room looks very cottage-y and very nice! It also looks so clean and tidy. Just wondering where you store the toys for a baby and toddler. I think organizing toys is really a trick as kids pull them out all day. Any pointers there would be appreciated by many! looks lovely Meredith. You've been so productive, must feel great. The upholstered chair is so sweet! And Bitty's high chair is like my doll's from the 60s (our Bitty kept slipping through, though, every time A. put her in. I can't bear to part with it, though it is a bear to store. Meredith, your DIY projects are fabulous. You never cease to show a little slice of blog world how beautiful can be budget friendly. That room is stunning. Nice job! I knew a lady who painted her sub-floor like that and then arrange cut-outs from a wallpaper that coordinated with the actual wallpaper. It was a fun look. I think she must have put a lot of polyurethane on top, though. To Catherine: We painted our kitchen floor with porch paint. The subflooring was plywood--had to do some patching and then a really good sanding. We primed first and then put down about 4 coats of paint. We put an area rug under the table and it looked quite nice. A reasonable solution for lack of funds! So incredibly lovely! I had to tweet that post so others can see. What a thrifty solution and I love how much it brightens up the room. I love your practical solutions!! That is just gorgeous! Thank you for sharing this wonderful idea! Oh my goodness, that is simply beautiful! It is so inviting and cozy - I can just imagine the sweet feet playing in and around that room! WOW! I LOVE LOVE LOVE this! Possibly a solution to our yucky peel and stick kitchen floors. So pretty! How do you find the time? I also love the yellow kitchen. Such a pretty, happy color. I bet it brings a smile to your face every time you step into your kitchen. WOW. I would have never thought that would look so fabulous. I wonder how it would look to paint a concrete slab? That looks like a lovely summer retreat! Great solution. So simple and so pretty! As I scrolled down, for a moment I thought it was actually a picture from a catalog. 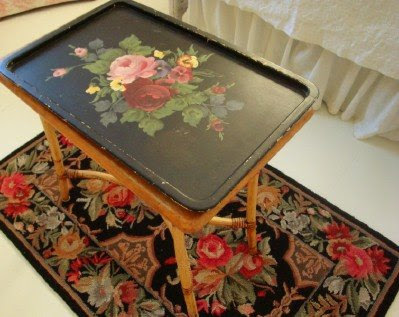 Then I started recognizing furniture and other pieces from reading your blog over the years. As always, beautifully done! It sure looks good. Very light. Oh wow that looks great! I've been debating on what to do with our floors. I'm going to show this post to my husband. Thanks for sharing! Thanks, everyone. I really appreciate the compliments! If you are thinking about painting your own floors, I would think long and hard before doing it in a high traffic area like a dining room. Chairs scraping in and out from the table twice a day might not wear so well. If you are bothered by scuffs and scratches, you probably don't want a painted floor. However, if your alternative is gross carpet, and you'd like a temporary solution (or long term, depending on how it wears), painted floors may be worth a try. My thinking was this: so what if we hate it 2 years from now? The paint won't affect another installation of carpet or of real hardwood, should I get brave enough to have all the floors redone. I have painted 3 floors in addition to this one: plank with white wood stain, concrete with an oil-based concrete paint, and a rougher subfloor with basic porch paint. This job was the easiest because the plywood floor is a finer grade than most. I think it's a finish grade. This thin Sherwin Williams paint lets the grain show through. If you are thinking about painting your floors, you may want to go back and read the comments from the original floor post. A few people had bad experiences adn shared the details there. Wow, that floor looks terrific and what a frugal way to replace outdated carpet! I love it! I'm always drawn to rooms with painted floors in decorating books and magazines. I love that it's so light and airy and clean without being sterile. 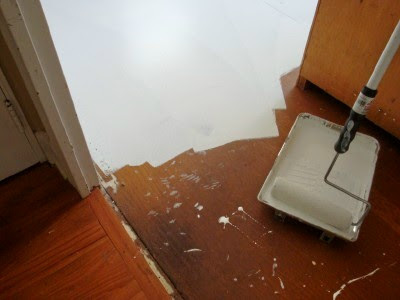 Unfortunately in our kids' bedrooms, there was linoleum under the carpets, and under that was a layer of tar-y glue that can't be gotten off the hardwoods at the bottom. So we went with a laminate. But I love, love, love yours! It's gorgeous! I would never have thought of painting a bedroom floor. I did this same thing in our old house- also white in a bedroom but the best was the kitchen. We did the white and green checkerboard but honestly it got too dingy looking from the foot traffic so painted it a dark red and it was fantastic! Used Kilz paint. Kept saying we would put in hardwood but it was there for years and got a ton of compliments. Once a year it would get a fresh coat on it. I even painted a faux rug at the sink one year. It is just beautiful. I did this job once and I thought it would kill me! Well done, so very tasteful. Beautiful...what a feminine and pretty room. Worth the work...easy for ME to say! I tired to do this as well, but we have that pressed wood subfloor and it didn't take the paint well. I tried it in a small area under the rug in a corner. I think you have a different subfloor from what I can see in the picture. 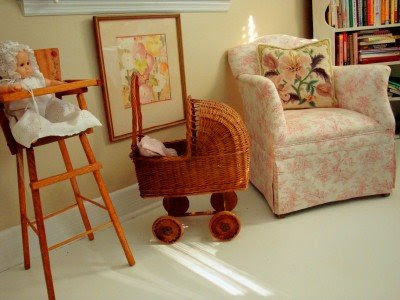 i love love love the doll high chair and especially the wicker baby buggy. i don't even want to know how little you paid. we looked and looked for something like that. in the end, my parents bought my daughter a new one. she adores it, which, i suppose, is equally important! The floor is smashing. Even nicer is the opportunity to see your lovely rooms! You have such a talent. Thanks for sharing. I LOVE IT!!! Much better than stain!!! Absolutely beautiful! I'm so impressed! You are my homemaking SHE-ro! Painted floors are lovely! I see them in cottage/country magazines all the time. My hubby and I's friends in PA painted all the wood floors in their house and even painted a fraktur-style "rug" in their living room. His floors are pretty idestructable. If I ever paint my floors, I'm going to ask him what he did to make them so oops-proof. Thank you for the porch paint suggestion--I didn't know there was such a thing! I need a quick fix for a hideous (think 1970 avocado green and gold) linoleum floor with paint stains on it (before we moved in the painters sprayed the bathroom and didn't bother to cover the floor so it's inherently ugly and newly splotchy). It has an embossed tile pattern in it, so even with paint it would have a little texture, but that's ok.
i'm about to do the same thing!! whole second floor of our new home is in need of refinishing- to the tune of $3000. right. i'll go with $80 of paint instead. and we don't live there yet, so no furniture to move or kids to camp out! thanks for the tip on felt pads for the beds & chairs- i might not have thought of that! This is LOVELY. Wish I'd had the thought, guts and permission to do this when I needed a new floor. First visit to your blog, can't wait to read more! 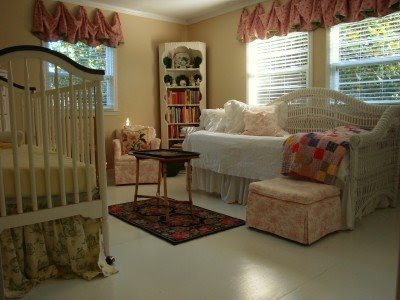 What a pretty girl's room, I love the toile chairs. I think the floor looks great! If you wait for everything to be perfect, nothing will ever get done! LOVE IT! We painted the kids' bedroom floors at our previous house. Meredith - I love your room - can you tell more about how you made those curtains? Is it a pattern or a guesstimate job? Basic tut, pretty please? I love how the floors turned out. Can you share what paint color is on the walls? I sure love those floors! I may try it here. I'm a little nervous that our subfloors might not be good enough. I'll definitely take a look under the carpet!